Last week saw Trieste hosting the famous Barcolana regatta which included a classic yacht division with the ‘Vertue Adriatic Fleet’ appearing yet again. Edwin Mazzanti, who owns the beautiful Elkins built vertue Return tells me that the fleet was also going to include Bettina, Fab, and Jan Gilda. Of course the famous Vertue xxxv is based in that area too, but will not apparently be taking part, nor will the Cheoy Lee built Lan Tao. Edwin keeps Return beautifully and has said he will send a full report about the regatta which I hope to pass on in due course. This correspondence illustrates another way in which the VertueYachts website can work, by passing on news such as this to a wider circle of vertue enthusiasts. So this month, I am going to relate some of the contacts that have been made, to give you some idea of the variety of vertue related news that exists. But let me start with a confession. 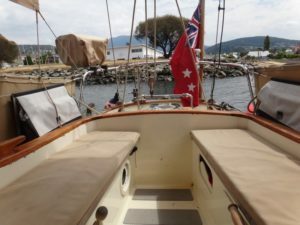 Since our wonderful visit to Hobart in 2014 where we met the ‘Tui’s’ and the ‘Island Vertue’s’ and took loads of photos of both boats, their ‘entries’ have been sadly neglected. The ‘Tui’s’ have recently sent us another copy of their boat description form, as mentioned above, so we have taken the hint and got that particular item ticked off the list as you can see! Following our reports on all the vertues that have recently been put on the market a number of people have made serious enquiries about both Vertuosa and Icebird after seeing them on this site, so I’m glad we have been some help. I can also report that Tanera has apparently been sold. We are happy to continue to list vertues for sale but we are not in a position to offer any kind of professional brokerage service. 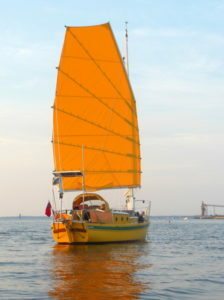 For those of us who are old enough to have been brought up on Eric Hiscock’s books, including especially Voyaging Under Sail, the name of Dr. Cunninghams’ Icebird reminds us of the romantic black and white plate of the boat lying alongside in English Harbour after her single-handed passage from Ireland. Here it is complete with caption describing how the little boat steered herself most of the way back to Ireland…..with not a self-steering vane in sight! Icebird is currently still for sale. 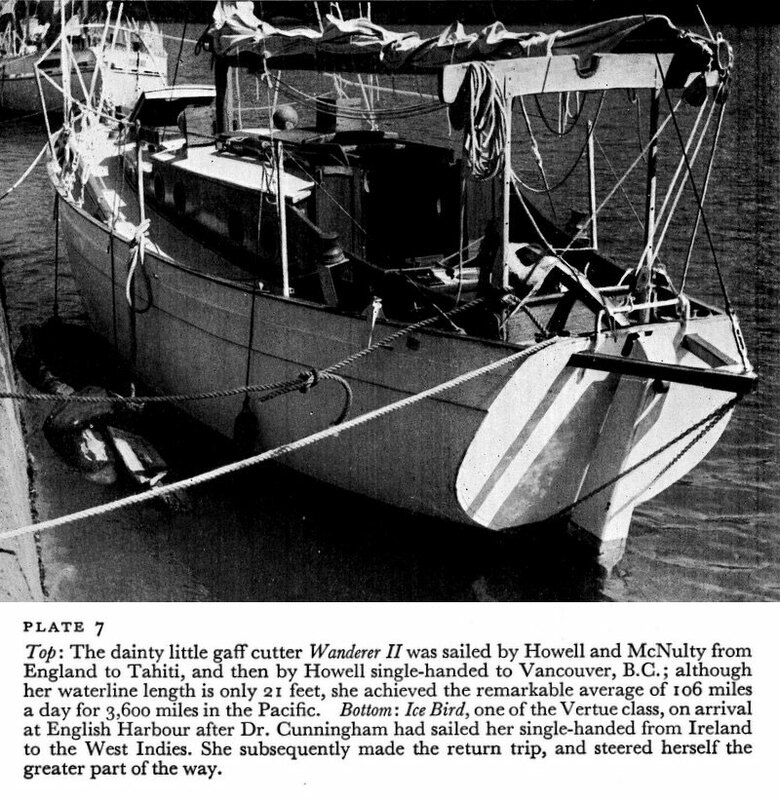 Both Icebird, V 45 and her predecessor Speedwell of Hong Kong V 44, are ‘ocean’ vertues with long, stepped coachroof’s, no doghouse, and an internal layout that usually provides for a larger chart table and galley area than the standard boats. 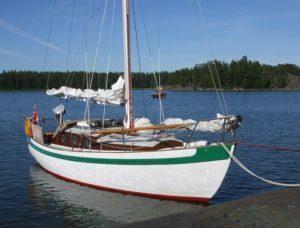 However, in complete contrast to Icebird, Speedwell is now rigged with a single unstayed mast, fully battened junk mainsail, and is cruised single handed by Shirley Carter. Her website, Speedwell Adventures is a complete joy and inspiration to those of us who have so far failed to ‘go simple, go small and go now’! Another vertue ‘blogger’ is Sonya Wallace who got in touch recently with a completed contact form for Thomasina and the news that she is about to rejuvenate their site SV Thomasina. 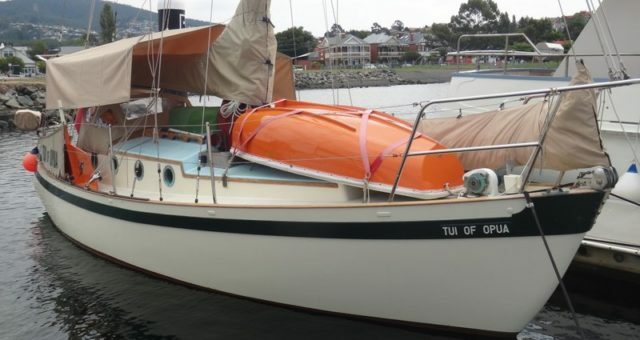 It sounds as if she and her husband John are about to embark on another cruise away from their base, in the wonderfully named Mooloolaba on the Queensland coast of Australia. Thomasina is another vertue without a doghouse, and I hope to be able to describe her in more detail in due course. It is well known that the original vertue was called Andrillot, pronounced ‘Andrio’. Recently the owners of V 176 Andrio, have been in touch with some pictures of their very smart looking grp foam sandwich constructed boat. 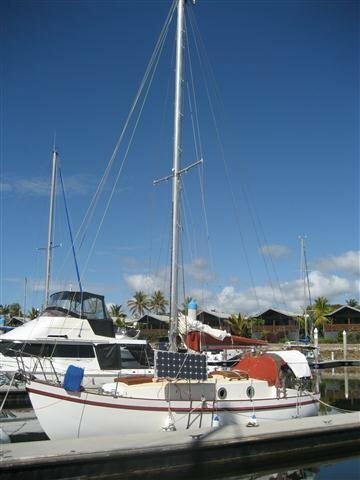 She was originally built in 1979 but her owners replaced he whole deck and coachroof structure in the mid 1990’s. She’s a very interesting version of the class in many ways, being built at about the same time as the first of the Mk II, grp boats but on the lines of the then standard wooden boats. Richard and Marion Heming have also been in touch with some notes about their delightful Wellow Maid V31. Although her construction was started in 1937, using the drawings for Andrillot, she was not launched until 1950 thanks to the intervention of Hitler’s war! She is well known in Solent waters but we have no pictures of her to show what an especially pretty vertue she is with her low, pre-war coachroof. So may I end this month’s notes with a plea for more vertue pictures, especially under sail, to be sent through so that we can all help to keep the site lively and interesting. I’m also thinking of setting up a regular feature on individual boats, so if you think yours is extra special, please get in touch: ideally with some pictures!